Personalized Hockey Gifts for Players and Coaches with YOUR TEXT and TEAM COLORS. 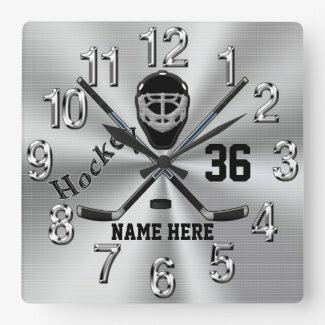 Super cool hockey clocks, hockey pillows and blankets, hockey ornaments, watches and more. Type in Your Text and Change the Background and Text Colors to ANY Color. OR, call me, Designer Linda and I will create the personalised hockey gifts for you in your colors and text templates to fit your text. Free design service with no obligation to buy. You will see the new hockey design before you buy it. ABOVE are the SAME Hockey Watch with Colors Changed or you Choose from many different Hockey Watch Styles. Your Text and Background Colors. What to get a Hockey Player for Christmas? Here are some really cool customizable personalized hockey gift for players, hockey lovers gifts, coaches and fans. I can customized any parts of any of my designs on any of the hundreds of gifts offered by world renown Zazzle. 100% money back guarantee with the most amazing brilliant print on demand you may have ever seen. As an independent Zazzle Pro Designer, I can customize my designs for you at no extra cost. Once you approve the new design, you can purchase it from Zazzle. Look into ZBlack Free Shipping subscription for a year for under $10 per year. Amazing Service and Amazing Products. Great memory gifts for hockey players and coaches. Call Zazzle Designer, Linda, to HELP you customize it with YOUR TEXT and or YOUR COLORS. Thank you for stopping by our Personalized Hockey Gifts. Call Linda if you would like any changes to any of our designs. I can creat the hockey gifts in your room or team colors.